GTE Director of Marketing Mandy Zurbrick was looking to conduct a multifaceted, integrated marketing campaign for their new U22 account to intrigue young, prospective GTE members. U22 was designed for first-time account holders aged 12-22 with parents as an additional target segment. For their first social media campaign, GTE needed a strategy that would highlight the U22 account and promote its most attractive benefits–earning redeemable points, overdraft forgiveness and parental monitoring. That's where we stepped in. Find the ‘face of the campaign’ by executing an Open Casting Call event. Plan, design, and launch a multi-platform advertising campaign. Promote the U22 account while positioning the GTE Financial brand front and center. We kicked off the campaign by coordinating and executing an Open Casting Call–we sorted through 125 promising young candidates (and countless others via YouTube submissions) who auditioned in-person to be the face of the U22 campaign. After narrowing down the options, we selected college student Alex Perez and 12-year old musician Caroline Kudelko to represent the U22 initiative through TV commercials and numerous banner ads. We launched a multimedia campaign across the Tampa Bay area on television, radio, outdoor and social media platforms (Twitter, YouTube and Flickr) all within a three month span. 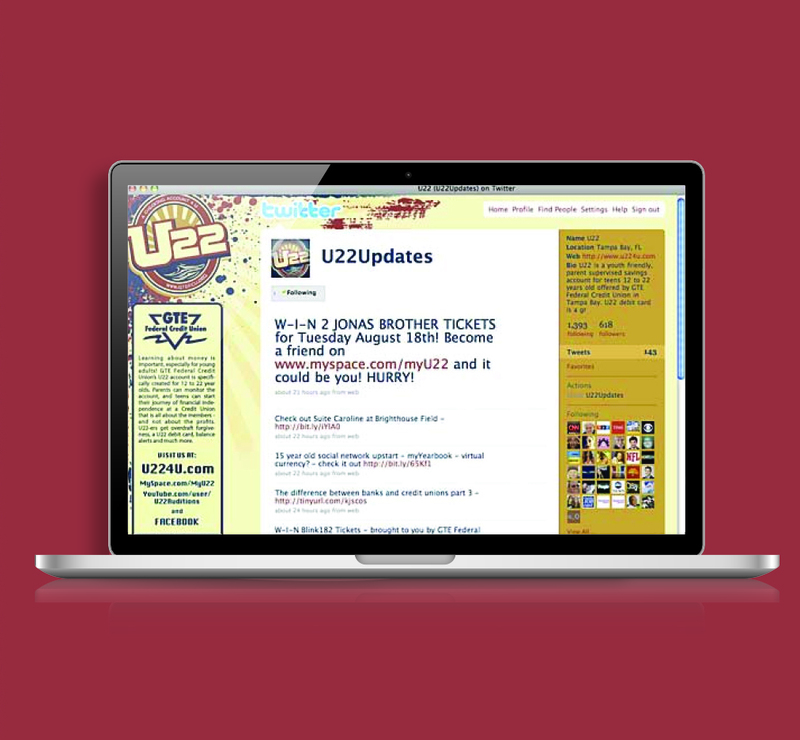 While we were full-speed-ahead with print design materials, social media contests and digital promos, we launched the U22 website in conjunction with GTE. The site was designed to anchor the campaign's digital side while also introducing a familiar face as the official U22 ambassador: Rays all-star Evan Longoria. We partnered with the Rays to ensure that those who registered as a U22 member before the launch date would receive two tickets to a Rays game–and a chance to meet Evan in person! Our partnership with GTE lasted well past the campaign, as GTE enjoyed positive results and an increasing U22 membership count.